Helen Thompson (author) will sign copies of her book promptly following her talk. Books will be available at Hayden & Fandetta Books (Booth B53) and signed before and after the presentation. Here, conceptual artist Michael Phelan lives in a former Texaco service station with battery acid stains on the concrete floor and a twenty-foot dining table lining one wall. A chef’s modest house comes with the satisfaction of being handmade down to its side tables and bath, which expands into a private courtyard with an outdoor tub. Another artist uses the many rooms of her house, a former jail, to shift between different mediums—with Judd’s Fort D. A. Russell works always visible from her second-story sun porch. Extraordinary building costs mean that Marfa dwellers embrace a culture of frontier ingenuity and freedom from excess—salvaged metal signs become sliding doors and lengths of pipe become lighting fixtures, industrial warehouses are redesigned after the area’s white-cube galleries to create space for private or personally created art collections, and other materials are suggested by the land itself: walls are made of adobe bricks or rammed earth to form sculptural courtyards, or, in one remarkable instance, a mix of mud and brick plastered with local soils, cactus mucilage, horse manure, and straw. 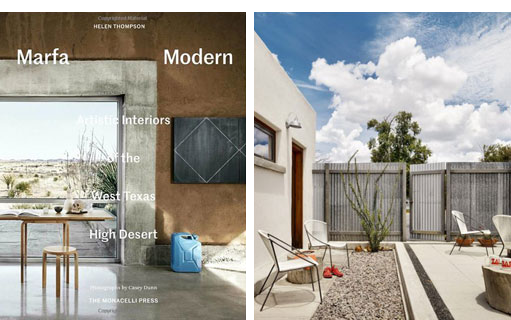 "Thompson’s clear, brief essays describe how each homeowner arrived in Marfa—a nice contextual touch, given that it’s a remote place where residents and visitors have to decide very consciously to be. Her descriptions of plans, materials, and design concepts give heft to what could have simply been a lifestyle coffee table book. Photographer Casey Dunn leaves people and styling (extraneous food, flowers, and props) out of his shots, for the most part, which keeps the focus on design choices as well as the play of the desert light inside. The result is a visual page-turner and is clearly a result of Thompson’s reporting skills from her days at Metropolitan Home magazine. 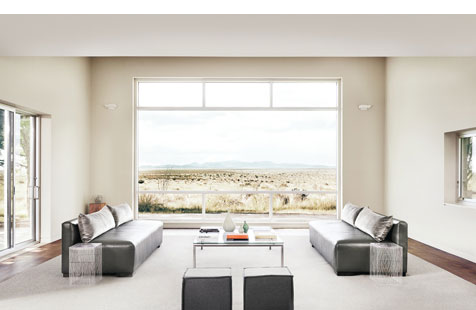 Marfa Modern serves as a primer on how a “watering hole” that [Donald] Judd put on the map has evolved without him, and lets it lay claim to importance as a place of vernacular design, not solely an art destination."